The “Site Map” is used to manage areas and subsections within your website. This is where you are able to edit, delete and re-order areas or subsections. One of the best parts about the site map is that it allows you to see, at a quick glance, what areas and subsections you have within your website. To view the Site Map, please follow the following steps. Click the “Site Map” link in the side navigation. You should be able to see something like what’s shown below. As you can see, there is a folder icon next to the name of each area. If you click on one of the folder icons, the pages within that area will be listed below the folder. To edit or delete an existing area or page click the appropriate link on the right hand side of the area or page of your choice. 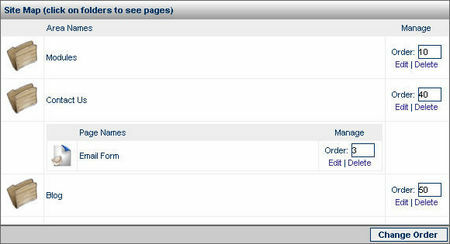 From here, you can also create a new area or page by clicking on the “Create A New Area” or “Create A New Page” link. For more information on creating new areas or pages, please refer to either the “Areas” or “Subsections”.